Maersk's, the largest shipping company in the world, COO has apparently said "we will have to abandon fossil fuels", by 2050. Weaning their massive fleet off oil in that time span requires at some point in the next decade no more fossil fuelled ships will be brought as they have such long life spans. Where Maersk steams to, others follow. My bet is hydrogen powering these ships, produced from renewables. Energy dense, actually safer then a heavier than air fuel, easy to use (less crew needed, if any at all) and hydrogen production via renewables as a technology has really moved on in the background. sinking all ships of 400 feet length and more and downing all airplanes with four engines and more . to tumble them for magically 1000 years of the realm . I think chemical batteries (lithium, vanadium, etc.) will be the way to go for the next 20 years. In this time, fossil fuels will still be the fuel of choice to move big things like container ships. As soon as fuel cell batteries become reliable, cost effective, and have the needed infrastructure, they will take over the world. Hydrogen probably will be the eventual winner in the end. But I suspect fossil fuels will still be consumed in massive quantities even when we no longer use it as transportation fuel. Plastics of all types are just too hard to be replaced by another material. Plastics of all types are just too hard to be replaced by another material. Don't bet on it. I see quite often the argument that the chemical feedstock side of the industry will make up for the loss in oil sold to burn but it's just really hydrocarbons for the most parts. Hydrogen and carbon are not exactly rare or difficult to come by from other sources. Using these other sources will also make it easier to widen the plastic types used, making them better for use and also designing them for easy recycling or biodegradable. I was thinking that eventually, like after 2040, when fossil fuel consumption for transportation drops to nearly zero world wide, the cost of fossil fuel will drop. Like sub $15 USD per barrel (say using 2018 USD for inflation adjustment). The Kingdom of SA, Russia, and other major producers will still be pumping them out of the ground. But at such low cost for feed stock, together with petrol chemical infrastructures already build, the economy of scale would be hard for other forms of plastics to compete with. I don't know where to find data on how carbon intensive bio plastic / recycling is when used in as large of scale as today's petrol chemical production. So this is just me thinking out loud without any thing to back up my theory. Given that you need over 100,000 hp to move one of the Maersk Lines' massive ships, and that Maersk as I recall has some 400 of them, the only logical power plant that I can see other than the now-well-proven heavy oil diesel is the packaged nuclear reactor. Reactors are well-developed in naval service, with US subs all bbuilt with only reactors, and aircraft carriers also only built with reactors, typically four units per ship. Given this long development history, the naval units constructed by General Atomics (outside Albany NY) are thoroughly proven, and a direct drop-in replacement power plant. Whether or not the US Government is prepared to allow the commercial sale of this particular power plant is another thing entirely. A new-design reactor requiring basically no safety controls, as it is self-extinguishing in the event of over-heat, is the Thorium reactor. If the USA does not release the General Atomics design, I predict that another will step up and build these Thorium molten-salt designs, and for Maersk that would be in the 100-MW range. The costs will be down to the level of the diesel, possibly a touch lower. Logically, Maersk would fund the development, as once built, they have no ongoing fuel costs. Remember that a US aircraft carrier goes 25 years without re-fuelling. 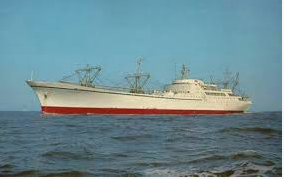 The very first nuclear-powered merchant ship was the NS Savannah, built in the USA. Here is a picture. Note the cargo derricks; this was built before containerization. Additional to cargo, the Savannah also carried passengers in style; I think perhaps 70 or so. The reactor was a pressurized-water design, same as US naval vessels (no surprise there). You can find the Savannah in cold layup (long-term storage) at Pier 13 in Baltimore Harbor, Maryland. They don't let you wander on board, but with some negotiation in advance you just might be able to snag a tour. Yup, the future was back in the 1950's. Mixed plastics can be converted back into oil. Not going to happen. Perfect target for a terrorist to beech one near a major city and crack one open. The radiation leakage doesn't need to be much if any at all to induce panic in the general population. I see you enjoy being disruptive. You consistently attack any concept and attempt to undermine it. That is what AI bots do. Well suggesting putting nuclear reactors on ships like that, all I was doing was pointing out the obvious hole in the plan. Are you still suggesting I'm actually an AI? the reality is I'm a DH. The thing with renewables is you need to over build which isn't an issue with the cost trends going where they are. Then when to much electricity is been produced industries like making hydrogen will take advantage of this mega cheap electricity to make the hydrogen. Terrorists are going to love all these reactors floating around, hijack a boat (we've seen that's all to easy) sail near a city and crack the thing open. Not to mention it's still way too expensive for mass adoption, whatever backers say. Exactly, this is why I think many more decades needs to pass before we see "hydrogen power" becomes the norm. In the main time, chemical batteries ahoy! @Jan van EckI have to go with @DA?on this one. What you said makes sense, to a degree, on paper. But as a commercial fleet it's going to be very hard to realize. There are just too much government red tape for this. Besides, Maersk share holders are going to vote out any CEO who wants to try this. Investors, by and large, would not want to take risks that may hurt the share price. What sunk the Scopion? The Thresher?And pretty sure at least a couple Soviet boats had reactor problems and were scuttled. Other scuttled Soviet nuke subs are an environmental timebomb. Not that I think nukes are that dangerous but today, but it’s dam expensive and political selling the notion of coal powered ships would be easier. For subs and aircraft carriers it’s the way to go. I’d rather burn oil or if an LNG ship, gas. while we’re at it, sailboats. Worked fine for a long time. OK, that is silly. while we’re at it, sailboats. Worked fine for a long time. OK, that is silly﻿. As a fuel saver not so silly several projects are going testing various different techniques. Although nothing looks like a traditional sail. But understanding the structure of gigantic ships that do not use fossil fuels is somewhat complicated. ﻿Not﻿ to mention it's still way too expensive for mass adoption, whatever backers say. Heres a Fullycharged video of how they are starting the process for using hydrogen on ships. as I said before when the renewables produce to much electricity the excess electricity switch's over to producing hydrogen, this dramatically cuts costs. This is today, give it another decade. "Orkney, makes too much electricity from renewables. after the entire Islands electricity needs are met, they try and export the rest. Except they've run into a limit with exporting. So they're using all the electricity they can, and they're exporting all they can, and they still have some left over. So they're using electrolysis to create hydrogen, which, whilst not an efficient way to do it, it's carbon neutral and you're using what would be wasted electricity anyway. They're then storing that hydrogen to be transported to be used in a Fuel cell which can be used to power auxilliary power for docked Ferries, whilst they work out the logistics and training to get the ferries powered completely by hydrogen." That's not exactly "using hydrogen on ships". The problem of wanting to melt a naval nuclear reactor is mainly physics, because of the square-cube law, a small naval nuclear reactor has naturally very low specific power which means it has very little danger of overheating, also because they mostly have metallic fuel elements they can dissipate heat very very fast. In the case of soviet-russian submarines, the alfa class reactor had a big problem, it was too safe, because it was lead cooled if it didn't operate at high power output and temperature then the reactor would shut off and the core freeze into a huge solid chunk of lead and bismuth. Actually, what sank the Thresher was a decision at the Groton shipyard of General Dynamics to braze the garbage door into its retaining hole in the hull, instead of welding. Brazing is a fast and cheaper way to join two metals, but the trade-off is that the brazed joints are weaker than the surrounding steel. With a proper weld, the weld itself is equally as strong as the steel plates it joins. It was a rather large opening, several feet square, and when the Thresher went to its pressure-depth test dive, the brazing let loose, and water started rushing in. In yet another irony, the captain then ordered "emergency blow," to rapidly surface. The stored air in the blow bottles then very rapidly expanded through the blow valves, causing a dramatic drop in temperature of the airstream. Unfortunately, that compressed air had water vapor in it, so when the temp dropped, the water vapor froze inside the blow valves,, thus disabling the ability to surface. As the ship filled with outside water from the ruptured garbage door, it sank below the crush design depth, the hull collapsed, and that was the end. In future subs, the garbage door was welded instead of brazed. I don't know what was done about the freeze-up problem of the blow valves, but I suspect that air-dryer filters were installed into the compressor system, to get that water vapor out of there. This is known as "tombstone engineering," where improvements are made over the tombstones of the dead. You see that a lot in aviation. French shipping company CMA-CGM choose to switch to LNG powered container chips and is building a new generation fleet of 22'000 teu giant container ships powered by LNG. Nicely done on taking words out of context. Yes they aren't doing it now, but as I said wait ten years then we'll see it. What this video helps demonstrate is as renewables keep getting more cheaper than fossil fuels, then hydrogen production becomes an obvious choice when to much electricity is produced. Even if the trend is half todays then that will still be around 10% per year fall in costs, bringing renewables out at almost a third of todays costs. So that's pretty much for solar and wind in most market's under 2cents per kilowatt hour, some areas getting down to 1cent. You can well over do renewables on that and still kick fossils arse. So for quite a bit of the time there will be excess electricity looking for adaptable industries to use it. Making hydrogen has come on recently and the infrastructure isn't expensive to set up, mixed with dam cheap electricity, bingo. As said in the video they could not adapt those ferries as they were of old stock with the shaft linking propeller and engine and also no training course was available for the crew. So they are training crew on hydrogen use and will as the ferries are replaced bring on hydrogen powered boats and create a training centre at the same time for others. It really seems there is some blockage on quite a few people's understanding of renewables and their costs and trends. All sorts of arguments are put forth that only stand up if data is cherry picked or words taken out of context and so forth. Why would the trends in renewables and other related tech come to a halt all of a sudden? Why can't related areas be taken in to account, say with dam cheap renewable electricity this could help in paying for the infrastructure change required, resulting in cheaper electricity. It really seems there is some blockage on quite a few people's understanding of renewables and their costs and trends. Yup where do you think the costs will be in ten years?